Just to say that it’s been a very dark and sad week in the UK this week, with the horrific and mindless killing of very young, teenage and older families In Manchester. My five Grandchildren range from 6 years old up to almost 18 years old, and they bring me so much joy, so my heart goes out to those, who like me, adore their families and have had to cope with the thoughts of the suffering of those killed who were so dear to them. But more and more, as these terrible things happen, we are all realising that reaching out to others, helping people of whatever religion or nationality is the answer. “Love thy neighbour” is a fantastic phrase, and I think that even though we are going through a very bitter election campaign, the UK is waking up to the fact that we, as a nation, are all immigrants going back the centuries, and it’s time we all mucked in together. OK, back to Asparagus. I’ve dug my own Asparagus 3 times now – once on an allotment shared with my lovely friend, Sandra, once when we first moved to Hornsea, and realised it was in the shade (stupid me! ), and the third time, in our sunny Kitchen Garden, at the very far end of our land. Amazing Asparagus & Recipes is what is says, recipes for Asparagus lovers like me. 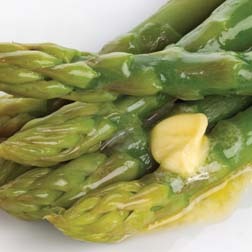 sharingourfoodadventures.com – Amazing Asparagus & Recipes. My newest Asparagus bed. – courtesy of Erik. When I was a tiny girl (years ago), my parents had a big garden, and inherited a well-tilled Kitchen Garden, complete with Asparagus beds. At my first ever taste, I think I uttered “Urgghh!” or something similar. But now I love it. With the sun shining so much in Hornsea, we’ve been working hard in the Kitchen Garden for a few weeks now, sowing, planting, weeding and watering. It’s now coming into it’s own, and looking quite good, and I’ve decided it’s time for some different Asparagus recipes. sharingourfoodadventures.com. – Amazing Asparagus & Recipes. The first in our Amazing Asparagus & Recipes selection is a fun one, light and almost crispy, just right for a Summer lunch or snack. Courtesy Debbie Major for Delicious mag. 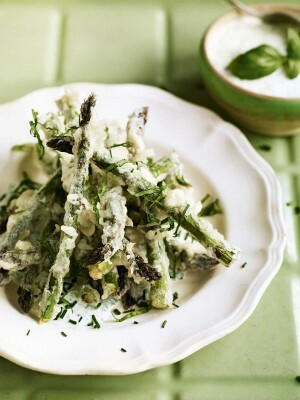 This Asparagus Tempura with Green Herb and Garlic Sauce recipe sounds absolutely delicious, and I will be cooking it this weekend. The Tempura batter can be used with other vegetables, and if you want to add sliced courgettes, or even fingers of Halloumi cheese, it should work well. Whizz all the ingredients in a mini food processor or in a jug with a stick blender. Taste and season with salt and a little freshly ground black pepper, then spoon into a one large or 4 small bowls and chill until needed. Heat the oil for deep-frying to 190C (use a digital probe thermometer). Make the batter by sifting the flour, cornflour and a small pinch of salt into a mixing bowl. Scoop 3 tbsp into a small bowl. Quickly stir the mineral or soda water into the remainder with a fork or chopsticks if you have some, until only just mixed in but still a bit lumpy, then sprinkle the reserved flour on top. This will create a few extra lumps in the batter as you dip, which helps give a light crisp batter. Cut or snap off the woody ends from each spear (and discard to use for such as sauces or soup) - then cut the spears in half lengthways. Drop the spears into the batter, about 5 at a time, (don't worry if one or two touch and stick together in one lump). Lift them out using 2 forks, then quickly drop about 5 spears at one time into the hot oil. Deep fry for one and a half minutes until crisp and very lightly golden, then remove the spears with a slotted spoon and drain briefly on to plenty of kitchen paper. Keep warm. Pile the battered asparagus onto warm plates, sprinkle with the chopped herbs and serve straightaway, with the green her and garlic sauce for dipping. Enjoy. I have many more Amazing Asparagus recipes to write up, but today I have to go to the Hospital again for my second dose of my Chemo drug, and we have to go quite early for such as blood-tests etc. It doesn’t hold too much fear for me as I think we have realised what gave me a bad reaction last week.